"These thousands, and tens and twenties of thousands of American young men, badly wounded, all sorts of wounds, operated on, pallid with diarrhea,... languishing, dying with fever, pneumonia, &c. open a new world somehow to me, giving closer insights, new things, exploring deeper mines than any yet, showing our humanity, (I sometimes put myself in fancy in the cot, with typhoid, or under the knife,) tried by terrible, fearfulest tests, probed deepest, the living soul's, the body's tragedies, bursting the petty bounds of art." So wrote Walt Whitman in March of 1863, in a letter telling friends in New York what he had witnessed in Washington's war hospitals. In this, we see both a description of war's ravages and a major artist's imaginative response to the horrors of war as it "bursts the petty bounds of art." 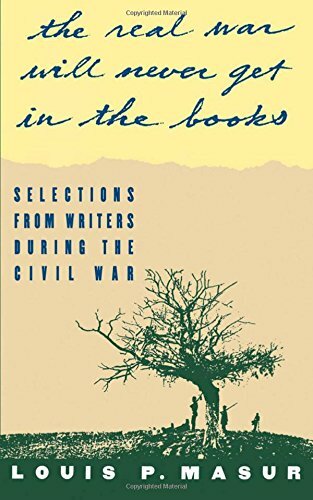 In "...the real war will never get in the books", Louis Masur has brought together fourteen of the most eloquent and articulate writers of the Civil War period, including such major literary figures as Nathaniel Hawthorne, Harriet Beecher Stowe, Ralph Waldo Emerson, Frederick Douglass, Herman Melville, Walt Whitman, Henry Adams, and Louisa May Alcott. Drawing on a wide range of material, including diaries, letters, and essays, Masur captures the reactions of these writers as the war was waged, providing a broad spectrum of views. Emerson, for instance, sees the war "come as a frosty October, which shall restore intellectual & moral power to these languid & dissipated populations." African-American writer Charlotte Forten writes sadly of the slaughter at Fort Wagner: "It seems very, very hard that the best and noblest must be the earliest called away. Especially has it been so throughout this dreadful war." There are writings by soldiers in combat. John Esten Cooke, a writer of popular pre-Revolutionary romances serving as a Confederate soldier under J.E.B. Stuart, describes Stonewall Jackson's uniform: "It was positively scorched by sun--had that dingy hue, the product of sun and rain, and contact with the ground...but the men of the old Stonewall Brigade loved that coat." And John De Forest, a Union officer, describes facing a Confederate volley: "It was a long rattle like that which a boy makes in running with a stick along a picket-fence, only vastly louder; and at the same time the sharp, quiet whit-whit of bullets chippered close to our ears." And along the way, we sample many vivid portraits of the era, perhaps the most surprising of which is Louisa May Alcott's explanation of why she preferred her noon-to-midnight schedule in a Washington hospital: "I like it as it leaves me time for a morning run which is what I need to keep well....I trot up & down the streets in all directions, some times to the Heights, then half way to Washington, again to the hill over which the long trains of army wagons are constantly vanishing & ambulances appearing. That way the fighting lies, & I long to follow." With unmatched intimacy and immediacy, "...the real war will never get in the books" illuminates the often painful intellectual and emotional efforts of fourteen accomplished writers as they come to grips with "The American Apocalypse."